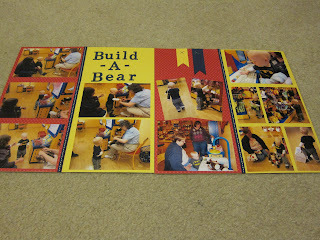 This was our "big" project last week in stamp club. If it looks familiar, you probably recognize it from the cover of the holiday catalog. It's not that hard, but it takes some time because you need 20 of the green and 20 of the red ornaments. After that, it's just a lot of folding and gluing. So while some people were making the other 3 projects part of the group made this and then we switched. 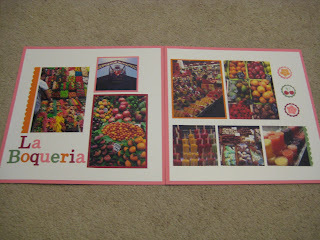 As I was thinking about the layout for Tuesday's scrapbook club, ﻿I had the idea to make the title multicolored. So then when I was looking at my pictures, I thought these market pictures would be perfect. The bright colors also worked for "regular" pictures too! Here's a great way to use the Paper Doily Sizzlit. It takes a little time punching out the pieces, but then goes together to make an easy, striking card. I added a fork bow at the top using a meat fork to make it a little bigger. Visit my Stampin' Up! website tomorrow (Monday, November 19) to check out the Stampin' Up! Online Holiday Extravaganza. The sale begins on Monday, November 19 and runs through 11:50 pm on Wednesday, November 28th (MT). So during these 10 days only, you can get incredible discounts-up to 50 percent-on some of your favorite products! In addition, there will be three products 20 percent off for 24-hours only on both the first and last days of Online Extravaganza. To take advantage of this sale, visit my website on Monday for all of the details and click shop now. I cased this card from my friend and fellow demonstrator, Mary McNeely. It was a popular swap card among my stampers so I decided they would be happy to have one of their own. I was experimenting with this candy cane striped paper and came up with a few different versions of the same basic card. I put out the stamps and supplies at my last stamp-a-stack so everyone could choose their stamp set and make one of the top two cards. The bottom card was my first card, but when I realized all of my stamp-a-stack cards were predominately white or vanilla, I decided to switch the colors around. Here's my first Watercolor Wishes card of the season, but I am sure it won't be the last. It is in the current holiday catalog, and I sure hope to see it in the new big catalog that will come out in June! At my last stamp-a-stack, some people chose to use the 2 steps to stamp it while others stamped it once in black and then colored with markers or watercolor crayons. When I first started stamping, I learned to use an envelope to make a small little bag. It never occurred to me until recently (thanks M.E.) that if you used a big envelope, you would get a bigger bag. So I went to the store for the white, large mailing envelopes, and it didn't occur to me until I got home and started in that I shouldn't have bought envelopes with the blue security print on the inside. To make the envelope, cut the top off and score the remaining three sides. Then stick you hand in the bag and gently work the corner into a gusset and score lines into the bag shape. Now there's no need to buy gift bags again! From November 1 through December 16, host a $450 party and choose a free set of ink pads. Or join the Stampin' Up! family and choose your free set. Gently Falling is one of my favorite stamp sets this time of year, and it seems to be very popular among my stampers. So we made this card as a fall card that could be made into a Thanksgiving card too. I saw a lot of birthday and thank you versions of this at my stamp-a-stack. A couple of weeks ago we did this layout in scrapbook club. I thought I would share Becky's take on that same layout. She rotated the page to accommodate her pictures and went with a bright, bold color combination to go with her nephew's first visit to Build-a-Bear. Careful placement of Post-it notes for masking and a few sponges makes a quick and easy card. Start with the darker color on the bottom and work your way up. I used Cajun Craze, Pumpkin Pie and Daffodil Delight. I should have taken my picture before stamp club because those sponges can smudge up a finished card when you toss them all into the same tub!